An average is the "normal" number of a group of numbers made by mixing the group of numbers. In math, an average is called a mean. It can be found by adding the numbers, then dividing the answer by the number of numbers there were. 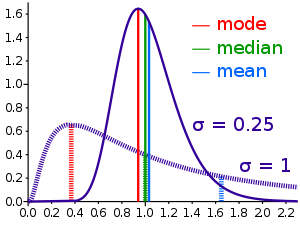 There are other kinds of mean, and other things that are sometimes thought of as "average" such as median or mode (statistics). In some sports, such as cricket and baseball, averages are used to tell how good a player is (such as batting average). Sporting averages have special rules for how to find them. This page was last changed on 20 February 2018, at 20:18.